Currently the dualism between the ‘this World’ and ‘other-sacred World’ stands partly dissolved in India. With the rise of politics in the guise of religion many a sacred women and men who are supposed to renounce this World for the ‘cause of sacred World’ seem to engage in the issues of ‘this World’. We have Sadhvi Niranjan Jyoti, Sakhshi Maharaj, Sadhvi Uma Bharati and Yogi Adiyanath, among others, who are adorning this space. While they are regarded as spiritual people, the reality is something else. Not only they are important players on the political scene, they also seem to be worst examples of ‘Hate speech’. It is not a pure coincidence that among those creating hate for the ‘other’ community, these holy women-men are at the forefront. While the likes of Maulana Maududi allied with military regime of Zia Ul Haq with the goal of Islamic Pakistan, the saffron robed ones are at the job of creating a Hindu state, this Worldly agenda of these sacred people! It is in this background that the Mahant of Gorakhnath Mutt, Adityanath Yogi, who is currently Chief Minister of UP also stated that “I believe that after Independence, the biggest lie in India is the word secular… No system can be secular. 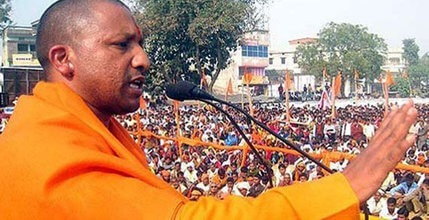 Political systems can be neutral towards sects, but not secular.” Yogi also said that a political system can be Path (Sect) Nirpeksh not neutral to religion and criticized the present practice of secularism as an appeasement of minorities. Mr. Yogi is the political associate of RSS Combine as he is not directly a member of RSS clan, but is politically affiliated to Hindu Mahasabha, which takes lineage from the major ideologue of Hindutva, Hind Nationalism, Savarkar. This ideology of Hindutva, shared by BJP-RSS-Hindu Mahasabha regards this Nation to be Hindu nation, and thinks that secularism is a Western plant on this nation. They were opposed to the freedom movement, and articulated that they should associate with British powers to oppose Muslim nationalism. Much like Muslim Nationalism, which it opposed, Hindu nationalism also had social roots in the declining sections of Rajas and Landlords, their values being based on hierarchy of caste, and gender. Muslim Nationalism and Hindu nationalism mutually targeted each other while hiding their agenda of subjugating lower castes/classes and women. When Indian Constitution was being formulated Hindu nationalists said that there is no need for a new Constitution as India already has glorious Constitution in the form of its Holy books, e.g. Manu Smriti. Incidentally burning of this book; was supported by the architect of Indian Constitution, Ambedkar. After Independence, India being plural, diverse and uneven; did face the problems in practice of secularism. Due to the guidance of Gandhi and Nehru, the complicated problems related to religion were well handled. On the issue of Cow slaughter and beef ban Gandhi and Nehru both opposed any such thing being brought in by state. In the matters of reconstruction of Somnath temple again, both these shining stars of secular values stated that state should not indulge in building of places of worship. These and other challenges which came are being exploited today by communalists to criticize secular values itself; the word Pseudo secular and Sickular were coined to humiliate the values which promote pluralism and diversity. One such issue was the issue of managing the wealth pouring in Temples. Government in all its wisdom went for managing the wealth and its spending by developing the mechanisms of having IAS officers to be part of the temple trusts. No such mechanisms was thought of for the bodies controlling Churches and Mosques. It is being put forward if this is an appeasement of minorities. This difference has been on the ground that Temples receive lot of donations in contrast to other places of Worship. It was to regulate the judicious spending of public wealth. The nature of wealth with these institutions has different background, so the diverse policy. Similarly there is a criticism in the matters of Hajj subsidy; the subsidy as such is given to Air India, the sole carrier. Similarly the state stepped in to take care of the infrastructure of Kumbh congregations with the idea that such vast assembly of people needs proper health, hygiene and transport related matters, purely the issues of this world. A lot is made of the personal laws. The Hindu Code Bill was planned for social reforms. Even it was envisaged as the beginning of the process to be followed by reform among other religious communities. The response to the Hindu Code Bill was very hostile, more so from Hindu Communal elements. Seeing this; the Bill was diluted, leading to resignation of Ambedkar from the Cabinet. This stalled any possibility of undertaking such reforms for minority communities, as they are more vulnerable. As communal violence started picking up, the issue of security of minority lives became central concern of minority communities and the process of reform among them was put on hold, to the detriment of the interest of women’s equality of those communities. Some flashes of welcome demand for reforms among these communities have come from the women from religious minorities. Most males of minority community stand opposed to such reforms for their own vested interests, while women from these communities are facing a dual threat. The first of these is the communal violence, of which they are the major victims. This violence throttles their longing for gender justice; still in opposition to this; some of them are braving it and are struggling for reforms. The likes of Yogi, steeped in Hindu nationalism, are unmindful of the need for promoting security of minorities; and label these as appeasement and call secularism as a lie.